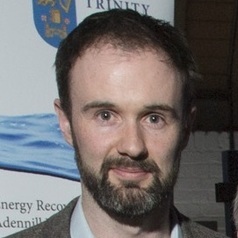 Assistant Professor in Energy & Environmental Systems Modelling in the School of Engineering at Trinity College Dublin. My research expertise is in delivering innovative solutions to current environmental and energy challenges and adopting a circular economy approach in the life cycle of measurement, modelling and mitigation. Currently Co-I on several European projects: €5.8m Horizon2020 iSCAPE project (urban design solutions for implementing passive air pollution controls); €3.4m Interreg Ireland-Wales Cooperation Dŵr Uisce project, and €2.9m Interreg Atlantic Area REDAWN project (delivery of energy recovery solutions in the water sector). Passionate about working closely with external researchers and industry partners to deliver action research. I'm actively involved in research dissemination through a range of social and public media outlets, and has experience delivering lectures and workshops to under- and post-graduate students across Europe.